This book by Mercedes Braunstein is targeted at beginners and the content is rather elementary. Compared to other books on perspective, this book is not as in depth. I felt that it could have included so much more information. It covers the usual concepts on perspective, the 1-2-3 point perspective, vanishing lines and points. Additionally, it has lots of examples based on real life subjects, such as furniture, streets, brick walls. There are also tips on drawing and shading. 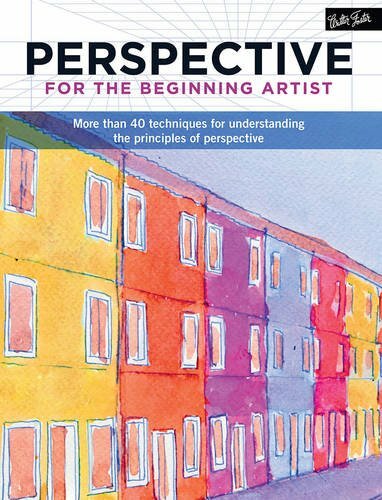 If you're a beginner with no knowledge of perspective, I guess this book is enough for teaching you the basic fundamentals. What's lacking is perhaps the technical knowledge. In the example of the gridded stone walkway, you're supposed to draw the stones progressively smaller and the lines closer as they move away from you in distance. Some other perspective books would actually teach the technique to find out just how small you should draw the stones as they move away, but not here. So while this book does talk about perspective, it's more like observational perspective with the focus on what you see. If you want to learn about how you can construct something based on perspective rules, this is not the book to get. It's a book accessible to beginners. However, I definitely felt like wanting more out of it. They would have included more technical knowledge. Overall, this is a book for those who want to start out simple. For those who want to learn more, you should check out other books on perspective.